This is my LAST day of "glamping"! I will be back on Monday! I have missed everyone so much! Ladies, if you don't already know Laura, you are going to LOVE her! She is not only one of the sweetest bloggers I know, she has some killer fashion skills. Her blog is fresh, fun, witty and full of inspiration. Let's all give her a warm welcome! Hello you wonderful readers of Because Shanna Said So! I know you were probably coming here today to see Shanna's usual perfect Friday outfit post, but instead I'm here. Bear with me folks. I'm Laura from Beauty & the Beard, and if you visit my blog you'll see a little bit of everything; some recipes, some DIY projects, and some major sarcasm. I wish I could do a clean "I'm from __________ and I now live __________ " but in the moment my boyfriend Michael and I have no home. No, no, no, this isn't some crazy Oprah sob story- we are just in a month-long process of moving. Yes, you read that right, month-long process. In the past 9 months we've been between Minnesota, Wisconsin and Virginia! If you're reading this on the 6th, we're currently in Maine...but make sure you check out my blog to see why we are bouncing around! F21 usually sells out and then brings styles back online, so if you can't find them check your local store! So, have Shanna and I convinced you to jump on the F21 bandwagon? Thanks for letting me blog crash Shanna! Don't forget to sign up for the Bauble Swap. It's a great way to meet new friends and get a bauble to add to your collection. Deadline is July 15th. Click on the button below for more information. A few ladies have already linked up their post and shared what they got from their partner! love those necklaces!! and i love F21, so don't worry, laura! i'm right there with you! love those necklaces!! and love that they are so cheap!! will check out her blog! I just bought #4 the other day! I feel cool now! Love Laura!!! :) & love these amazing bauble finds! Happy weekend!! I love Laura & F21 - so I'm definitely liking this post! 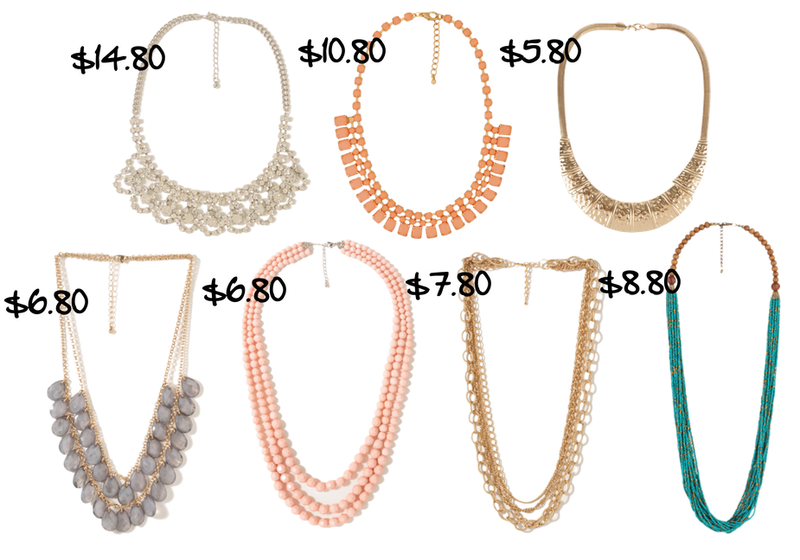 These necklaces are so affordable and totally adorable. Hey, did that rhyme? I'm a poet and didn't even know it! They are totally in style and look like they'd be from BaubleBar or something! Lovely all around! Happy weekend, Shanna! Love these necklaces! That gray one is my fav! thanks for having me you lovely lady!!!! I love the tribal turquoise one! I've had it in my online cart for a little bit. I just need to find $40 more so I can get free shipping. Great post, Laura! Those necklaces are beautiful! I love all of these necklaces! I actually almost bought the one you're wearing in the first pic. Maybe I should! And the one in the last pic you're wearing is AMAZING! Great necklaces! I really like them all. Great guest post!